The Russians sent two missions to Mars' asteroidal moon Phobos in the 1980s with microgravity robot landers, and another in 2011. All failed enroute, so that the lander technology was never tested. However, the designs are still interesting. They were designed to move around the surface of Phobos by hopping, without any fuel propellant, just rotating legs. (See papers by V.A. Simonenko and colleagues.) One probe lost communication en route to Mars, and the other lost communication at Phobos before landing. The latter is believed to have possibly suffered a fuel propellant explosion during a close-in maneuver. In 2011, the third (Fobos-Grunt) never got beyond low Earth orbit. The Japanese Hayabusa probe had a hopper but it failed to deploy. Hayabusa-2 is under construction for launch in 2012. For mining and a base on the surface, we need to look at means of attachment. The MIT Artificial Intelligence Laboratory has developed small, low mass robots and analyzed how they could be adapted to an asteroid environment. As in the Russian designs, hopping was adopted. The final design looks like a flat insect with six legs. Included in the MIT study were momentum wheels used to aid in stability during motion over the surface, and solar panels which could be cleaned of dust ("grooming"). Close attention was paid to joints sealed from dust and thermal management. (To keep out dust, it seems to me that a balloon type of ball joint is simple enough and this should be no such drama.) It was estimated this robot could completely scope out a 2 kilometer diameter asteroid in about 125 days. In addition to hopping, the claws of the robot could be designed to give the probe the capability to operate much like a rock climber in case the asteroid has a hard surface. One option they considered is to mimic an insect's legs, which have hooks capable of latching onto surface irregularities, which is what allows insects to walk across ceilings, or latching into fairly cohesive soil. A fairly generic robot with a combination of transport capabilities would be able to adapt to different asteroids' environments as well as different environments on the same asteroid. Such a multifaceted design could result in standard asteroid robot capable of dealing with a wide range of conditions, without any need for another probe to go scope out the asteroid environment prior to sending the surface probe. Due to the low mass of asteroid robots, several robots could be sent on the same mission to an asteroid using a small rocket. Thus, it may also be feasible to send more than one kind of robot on a given scouting mission. Another group, the Space Studies Institute (SSI), the University of Southern California (USC), and the Jet Propulsion Lab (JPL), developed small robots called SKITs (Sub-Kilogram Intelligent Tele-robots) in the laboratory, of which a large group would be deployed. The mother craft would continue orbiting the asteroid and would serve as the communications relay to Earth. "A typical scenario for this research would be to release a number of vehicles with some communication capability, and with a specialization of functions on a simulated landscape. Humans would control the overall deployment policy but the telerobots would have some autonomy to deal with obstacles�. "The primary prospecting objectives for asteroids are surface imagery and a detailed determination of their composition. These diagnostic elements should be measured with sufficient global coverage to determine the scale and extent of chemical heterogeneity. In addition, in order to get samples that are pristine, a drill or some similar tool will be needed." The study did not try to come up with one recommended probe set, but rather to come up with concrete design alternatives which a prospector could choose from, depending upon the prospector's objectives, budget and other judgement factors. Tradeoff analyses are a main part of this research. The net can be small and anchored over one region, or it can be large and wrap around the asteroid. The net can consist of parallel and perpendicular cables - a square pattern, or it can consist of circular concentric rings. There are obvious variations of the above three kinds of units, especially breakouts among the latter two. How specialized or modular the SKITs may be is up to the design choice of the mission planner. 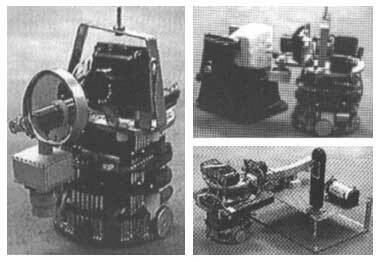 An impressive, complete setup of SKITs was demonstrated by the researchers in May 1997 at the Space Studies Institute's (SSI) Conference on Space Manufacturing XXIII in Princeton, New Jersey, using a base unit and several SKITs, each robot being a little smaller than an average coffee cup, as pictured here. The NASA Johnson Space Center (JSC) developed a flight instrument for probes to measure volatiles in samples of regolith "[f]or bodies such as the Moon or asteroids". It consists of a small programmable furnace which can measure volatiles released at different temperatures, a supply of reactant gas, and a quadrupole trap mass spectrometer. 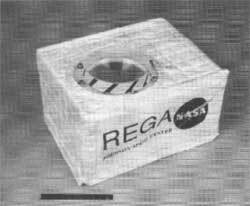 It is a small instrument, called REGA. "During 1996 we are conducting verification and calibration tests on the furnace and gas distribution systems. We will integrate these two systems with a quadruple mass spectrometer to be provided by University of Texas at Dallas. This instrument is modified from the mass spectrometer which flew on the Shuttle Wake Shield Facility during the summer of 1995. We will then perform a series of tests to determine the background, sensitivity, and performance of the integrated REGA. "Future work will build on the results of these tests. We will define the instrument's control, data and communication requirements and commence design of this system. We will fabricate an integrated prototype with its control and data system and conduct verification testing in a vacuum chamber. To complete this project we intend to bring REGA to a flight-ready status." This is obviously an outdated web page, but is slated for an update in 2012. There is additional work pending a write-up on this page.